This double sink measures 7-feet in length and features a 7-inch drop apron. Subtle drawers were incorporated into the apron for storage of small bath items. A tub surround was also cast out of concrete to match the sink. A doorway threshold made of concrete. 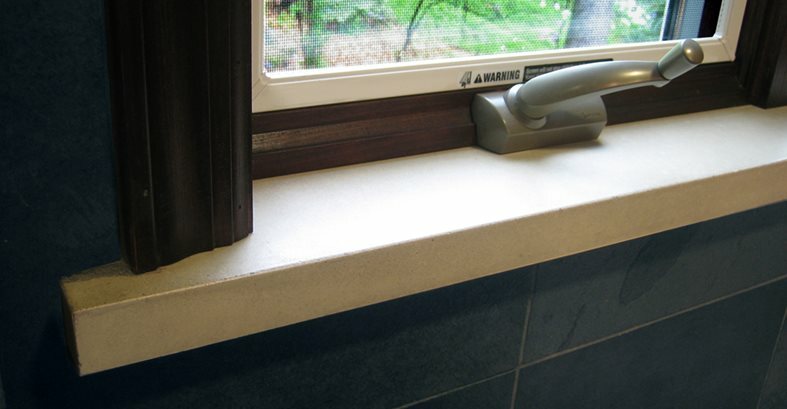 A windowsill made of concrete. The shower also has concrete detailing. Concrete is often used as the focal point of a room, whether it is formed as a fireplace surround, a coffee table, or a kitchen island. But the real versatility of concrete can be seen when all the elements in a room incorporate concrete. Such was the case on a job recently completed by Trueform Concrete in Flanders, NJ. 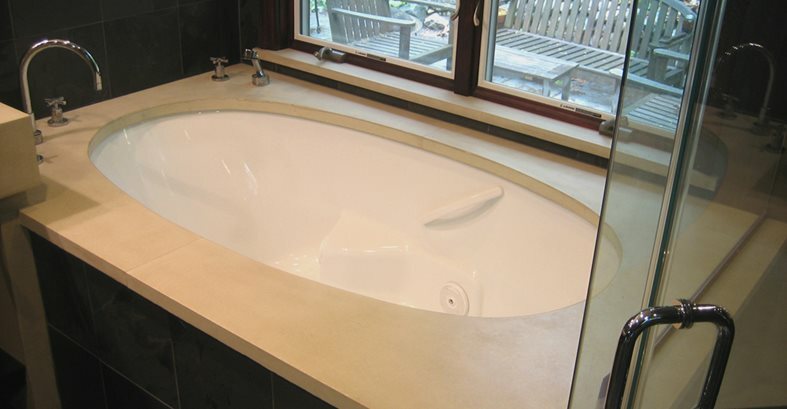 Trueform Concrete was asked to create a floating trough sink in a residential bathroom that connected to the tub surround and shower. Building on the client's original request, it was suggested to add concrete in other areas of the contemporary bathroom to tie everything together. The plan for the bathroom evolved to include concrete on every horizontal plane. In the end, the bathroom showcased the versatility of concrete with the trough sink, the tub, the shower, the window sill and the doorway threshold all made of concrete. Trueform Concrete fabricated the 4' integral trough sink with a 7" apron drop. 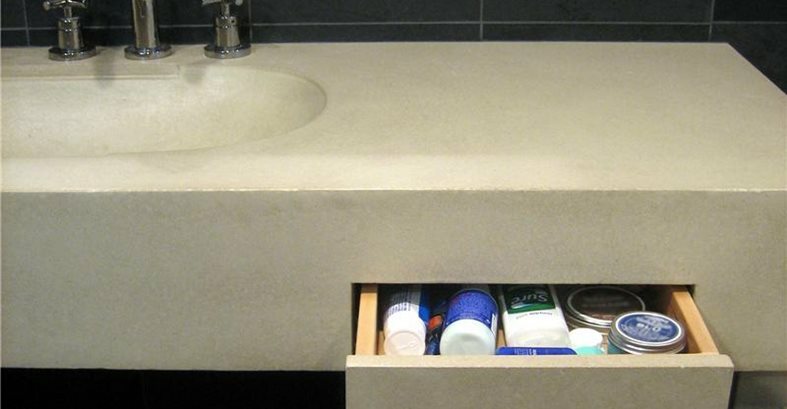 Needing a place to store small bath items, Trueform Concrete incorporated subtle-close feature drawers built into the apron, then created a concrete cap for the face of the wood drawers. Overall, the sink and countertops stretched 7' with a 22" deep sink. The sink was supported by two 4" thick legs on the left and right side as well as a piece of 2x2 tube steel. The backside of the right leg became the backsplash for the tub surround. 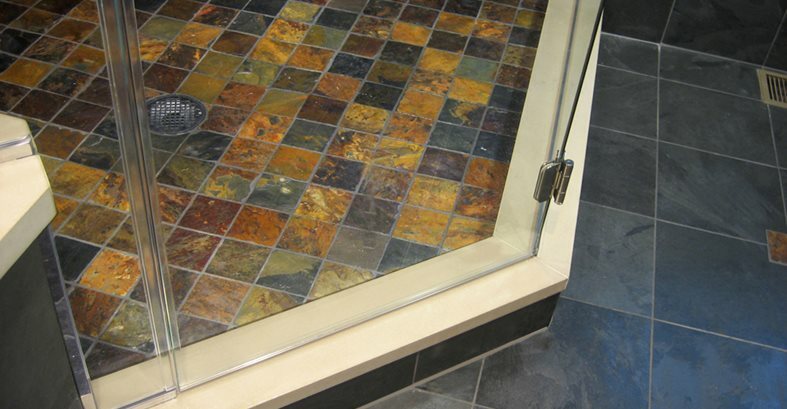 The tub surround extends out, and supports the glass wall in the shower, and acts as a shower bench and shelf. Shower and doorway thresholds and window sills were also cast in concrete to continue the look. 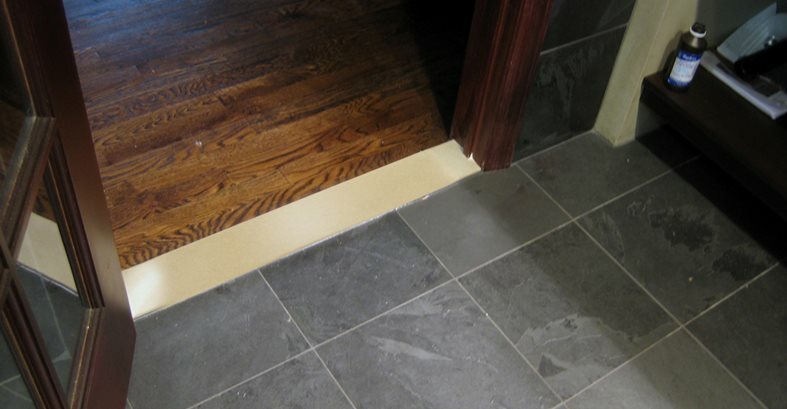 The bathroom was finished with black slate tile and Indian slate tile for the shower pan. 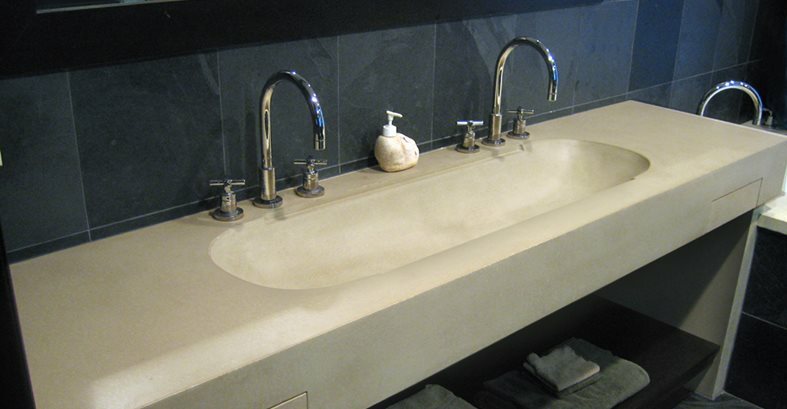 The color and finish of the pieces were Trueform Concrete's custom beige one color in a medium grind finish.